A new measurement method makes turbulence forecasts more reliable and flying more pleasant for both crews and passengers. Martijn Karssemeijer, Senior First Officer on a Boeing 747, looks at the visualization of his flight route. There are dots everywhere between Tehran and Frankfurt. If they are white, then the air is calm. 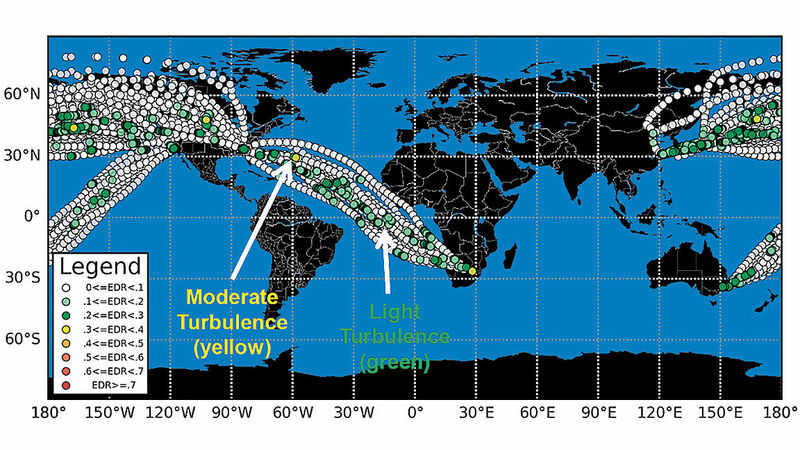 Green dots indicate minor vertical air movements, while yellow or orange dots mean turbulence. Sometimes turbulence literally comes out of a clear blue sky. First, there is slight juddering and then a sudden loss of height and the “Fasten seat belt” signs light up. “We still don’t have comprehensive forecasts that are accurate and reliable enough,” says 43-year-old Karssemeijer. Currently pilots are given a weather forecast during their briefing, showing flight legs of several hundred kilometers in length where it might or might not be bumpy. “That’s not a great help to us,” says A380 Copilot Oliver Matz. But Lufthansa pilots may soon have more accurate information about the location and strength of turbulence. Model forecasts will show turbulence on the navigation map in the cockpit. The eddy dissipation rate (EDR) measurement method is used on the electronic flight bag (EFB) in the cockpit to check the forecast. This produces a trail of white, green, yellow and orange dots. The EDR identifies how the energy in the atmosphere is distributed, regardless of the size, weight and speed of the aircraft. When an aircraft passes through turbulence, the system automatically records the strength of the shock on a scale from zero (calm) to one (extreme turbulence). In the future, aircraft will be able to send the figure and the coordinates via a server on the ground to other planes in real time. Pilots will be able to move to a different altitude or at least warn flight attendants and passengers in good time, according to Karssemeijer. This will also allow dispatchers to make their flight schedules more accurate. Karssemeijer, who is not only a pilot but also a project manager at Lufthansa, was responsible for implementing the EDR measurement method on the EFB. “We make use of a variety of avionics data and the different concepts of in-flight connectivity,” explains Matz. Together with Karssemeijer, Matz carried out successful tests of the new system on two flights to Frankfurt.